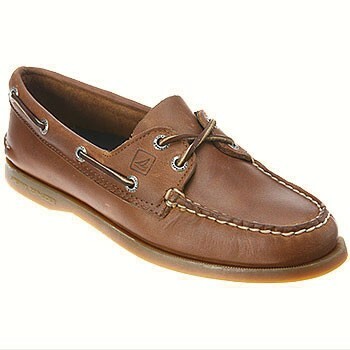 The original design that launched Sperry Top-Sider, this Men's Original 2-Eye Moccasin remains the benchmark for boating shoes. From the 360° lacing system with rust-proof eyelets to the shock-absorbing EVA heel cup, you can expect quality, comfort, and durability. Designed to be worn in all weather conditions, the leather uppers are stain and water resistant and the rubber sole with razor cut Wave Siping provides exceptional stability on wet or dry surfaces. Fans of these mocs say the longer you wear them, the better they look and feel. These shoes arrived in very good condition. They were just as described. The shipping time was long, but since it was free, I guess I can't complain.